Former Australian Survivor contestant, Samantha Gash made history when she became the world's first female and youngest person to complete Racing the Planet's Four Deserts Grand Slam in one calendar year. She has run over 10,000 kms across every continent on the planet and raised $292,000 for charity. She is a champion of women's empowerment and social change, using her platform to bring awareness to the plight of many through her role as Ambassador for World Vision and The Royal Flying Doctors Service. She is currently writing her memoirs with publishers Macmillan in New York City which is due for release in mid-2018. 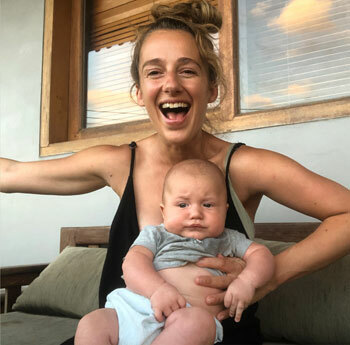 Question: How did Australian Survivor prepare you for surviving motherhood? Samantha Gash: Besides introducing me to my wonderful partner and father of my child, I wouldn't say Survivor prepared me for motherhood. We didn't sleep much on Survivor but sleep deprivation is a big part of my experiences as an ultra-runner and taking part in adventure races. Both of which have helped with the newborn days where the distinction between day and night are blurred. 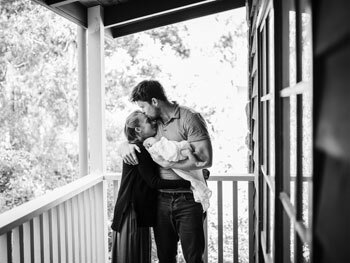 Many of the Survivor contestants play a beautiful part in our life as a new family. After our parents, AK was the first person to see Harry once he was born. Aimee lives 10 minutes from our house and is like an Aunty to Harry and younger sister to me. Tara also babysat Harry whilst I presented a keynote on the Gold Coast. Question: How did you return to exercise and running after childbirth? Samantha Gash: It has been a gradual process and I don't consider myself to have 'fully returned' to training. I was walking on the trails in the Dandenong Ranges where I live within a week after Harry was born, but I took it very slowly. My focus is on getting outside every day, it is healthy for the mind even more than it is for my body. I had a 5cm abdominal separation through pregnancy so my initial focus was to reduce the gap, strengthen the core and pelvic floor. I've made a lot of progress in this area but it is something I will keep working on as it is the foundation for my building up my training for future runs. Question: How did regaining your fitness make you a better mother to Harry? Samantha Gash: I have always been grateful for being able to move my body but I do even more now. I had a challenging pregnancy and there were weeks/months were I could hardly get out of bed as my heart rate would skyrocket and my blood pressure would plummet. I had several stays in hospital and more tests than I can count. Fitness as a Mum is more about giving yourself permission to look after yourself even when your desire is to prioritise your baby and your partner. Consciously looking after your body enables you to be happy and healthy. It helps me with my inner calmness, outward clarity and allows me to share even more love. Having a solid foundation of fitness set me up to deal with sleepless night and have perspective that the zombie state is only a short period of time, relatively speaking. Question: Can you talk us through how your fitness regime changed after the birth of Harry? Samantha Gash: I wouldn't consider it a regime. My goal was to be outdoors at some point every day, ideally for 20 minutes or more. Sometimes simply walking outside of my house and to the post office (600 metres away) was all I could manage. Carrying Harry in a baby carrier on pushing him in the pram on the steep trails was a form of incidental training. I did a 6 week program that focused on pelvic floor, posture and core strength and I am currently focusing on high intensity training that I can do at home as well as aim for one yoga class a week. After this I will gradually build into some longer sessions. Question: Can you tell us about your typical morning routine? Samantha Gash: I don't have a strict routine. We travel a lot for work and pleasure so we are pretty fluid and agile. That said, mornings generally involve playing with Harry in our bed whilst we have a cup of tea. We will read him a book, play peek-a-boo, sing songs (well I will) and then give him tummy time. We typically head out for coffee with Harry and then the day can go in many directions based on what we have on for that day. Question: What advice do you have for women wanting to return to exercise after childbirth? Clean sheet your recovery. Consider that you have a new body that needs to be built from the ground up. Question: How can mothers supercharge their incidental exercise with a new baby? Samantha Gash: For me walking with Harry is incidental exercise. It is the highlight of my day and I don't even see it as training. Harry is 7.5kgs right now, so i am hiking up hills with a decent weight on my front. It certainly gets the heart pumping without that even being the priority. Sometimes I will do lunges and squats whilst holding Harry. If you consistently did 10 repeats - 4 times throughout the day you are helping regain strength and it only takes a few moments here and there.